From a subtropical paradise to a surprising island escape in New England, read on for the top 10 snorkeling destinations in the U.S.
One of the most remote destinations for snorkeling in the U.S. is also one of the most beautiful. 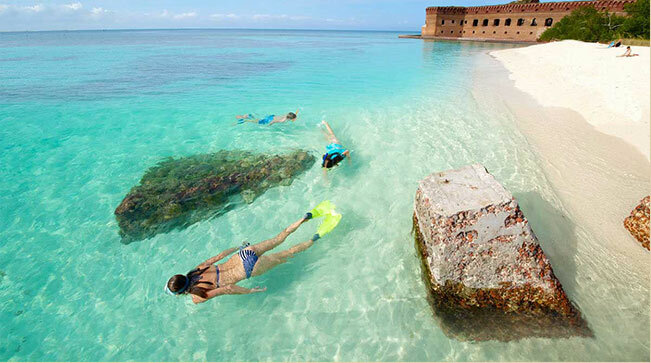 The Dry Tortugas are found 70 miles west of Key West at Fort Jefferson. Accessible by the Yankee Freedom III fast cat, you’ll traverse the crystal clear Gulf of Mexico, past uninhabited mangrove islands to reach this unspoiled paradise. Named by Ponce de Leon for the abundance of sea turtles he encountered, you also have a chance of discovering native loggerhead turtles and other subtropical marine life, like yellowtail snappers, sergeant majors, and healthy coral. Sand Key Lighthouse is a popular snorkeling destination in Key West for its abundant coral canyons and thriving marine life. Located seven miles due south, it can be reached in about an hour aboard an excursion with Fury Water Adventures. Part of the Florida Straits, which happens to be the third largest reef in the world, you’ll find magnificent rainbow and midnight blue parrotfish, stingrays, nurse sharks, yellowtail snapper and more. Covering 70 nautical square miles of the Atlantic Ocean off the coast of Key Largo, John Pennekamp Coral Reef State Park is the first designated underwater park in the U.S. It’s well known not only for its marine sanctuary and the Molasses Reef but also for Christ of the Abyss, a 4,000-pound statue of Jesus submerged in about 25-feet of water near Dry Rocks. It’s a bucket list destination for any serious snorkeler. Located about 90 miles north of Tampa on Florida’s west coast, Crystal River Preserve State Park provides a unique ecosystem for snorkeling in some of Florida’s clearest waters. The main attraction here is swimming with manatees, sometimes referred to as sea cows. These gentle giants are always a thrill to see and it’s truly special to swim alongside them. Located 22 miles off the coast of Los Angeles, Catalina is a famed Southern California getaway with a historic casino and miles of trails for hiking along its craggy bluffs. It’s also home to a unique ecosystem of lush kelp forests and rock coral where you have a chance of spotting California state fish, the garibaldi, as well as dolphins and other large pelagic fish. Popular spots for snorkeling include Lover’s Cove and Casino Point. A picturesque village in San Diego, La Jolla is famous for its surf break and laidback lifestyle on the Pacific Ocean. It’s also a top snorkel spot for viewing the stunning leopard shark, which migrate to the area in the summer months. Tap into your adventurous time as you submerge yourself in the hopes of spotting this apex predator in the wild. Afterwards, you’re ready to relax into a lovely day at the beach. Nestled between Newport Beach and Laguna Beach in Southern California’s Orange County, Crystal Cove State Park is home to a cove beach, hiking trails and tide pools for viewing sea creatures up close and personal. You can also enjoy snorkeling from Pelican Point or Reef Point for a chance to spot dolphins, stingrays, and garibaldi. Located at the southern edge of the West Maui Forest Reserve, Papalaua Wayside Park offers ideal conditions for snorkeling thanks to its shallow depths and thriving marine life. Look for green sea turtles, eagle rays and an assortment of tropical fish, including Hawaii’s state fish, the reef triggerfish—or, as it’s known to locals, the humuhumunukunukuapuaa 'a. Located on Oahu’s west shore, Makaha Beach Park offers sandy beaches and prime snorkeling directly from shore. Swim towards the buoys that mark the coral reef and look for everything from triggerfish, bluefin jacks, trumpet fish and eagle rays. It’s known for gentle surf in the winter months if you’d like to try another watersport on for size. On Block Island, with its crystal clear waters, rough, craggy cliffs and lush greenery, you won’t believe you’re at the tip of the Long Island Sound—that is until your toes touch the water. Known as the “Bermuda of the north,” this picturesque island off the coast of Rhode Island is a surprising snorkeling destination. With 17 miles of shoreline and a national wildlife refuge, the island is surrounded by abundant reefs. Just brace yourself for chilly water temperatures that top out around 70 degrees in the height of summer.